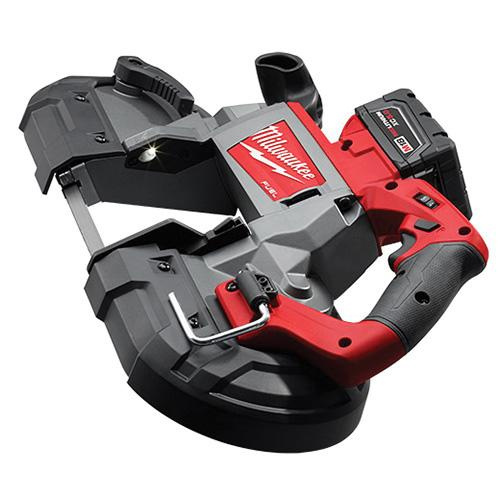 Milwaukee Tool M18 Fuel™ Tool Deep cut band saw kit offers increased cutting speed and power through POWERSTATE™ brushless motor. It uses constant power technology to maintain cut speed in the toughest applications for optimal performance. This band saw provides same legendary durability of a Milwaukee® corded band saw and delivers up to 2x more run time than other cordless options. It is equipped with jobsite armor technology for drops and debris protection with a proprietary composite material and crush zone barriers to absorb impacts. Kit includes M18 FUEL™ deep cut band saw, M18™ REDLITHIUM™ XC5 extended capacity battery pack, M18™ and M12™ multi-voltage charger, blade and carrying case. * Inventory displayed is accurate as of 04/26/2019 01:40 PDT.